California-laurel is the only tree of the family Lauraceae found in the western United States. It is a broadleaved evergreen tree with distinctly aromatic “bay” leaves. Often referred to as myrtlewood, California-laurel is one of the best known and most valuable western hardwoods. Typical California-laurels are 40 to 80 ft tall and 18 to 30 in. in diameter. On good bottomland sites, mature trees can attain diameters of 36 to 72 in. (159 in. maximum) and heights of over 100 ft (175 ft maximum). California-laurels may live at least 200 years. The trees often have forked or multiple stems with ascending branches, which form dense, round-topped crowns. In forest stands, the stems or limbs are relatively straight, vertical, and clear of smaller branches. Open-grown trees have broad spreading crowns (often wider than tree height) supported by several main stems or branches. The root system of California-laurel is wide and spreading, although it varies from shallow to deep, depending on the soil and drainage. The range of California-laurel extends from Reedsport, Oregon (lat 44 °N) to San Diego, California (lat 33 °N). It is not found more than 160 miles from the Pacific Coast. California-laurel is found in the Coast Ranges, the southwestern Cascade Range, and all along the western Sierra Nevada. The total inventory of California-laurel is about 520 MMCF of growing stock, of which 93 MMCF occurs in southwestern Oregon (Appendix 1, Table 1, excluding federal lands in southwestern Oregon, for which there are no recent estimates). Many of the best trees are found in parks and riparian areas. According to some representatives of the myrtlewood industry, available supplies of the high-value, figured wood are getting scarce. California-laurel is intermediate in tolerance of shade. Seedlings establish and grow at low light levels (1 to 18 percent of full sun), and saplings and intermediate trees are common with coniferous overstories. California-laurel can be a climax species, as it is long-lived and reproduces in the understory. A component of California-laurel is typically maintained by resprouting after fires in subclimax forests, which are most common outside of riparian areas. The leaf litter from California-laurel may have toxic effects on other vegetation; these toxic effects are a suspected cause for the typically sparse cover under California-laurel trees. On good sites, pure stands of California-laurel are generally restricted to small patches, while short or shrubby California-laurel often dominate more extensive areas. California-laurel is most commonly found in mixed stands; a great number of tree species are associated with laurel across its range. Common tree associates in the Pacific Northwest include red alder, cottonwood, willows, tanoak, Pacific madrone, wax myrtle, Oregon ash, Sitka spruce, Douglas-fir, Port-Orford-cedar, and redwood. Common shrub associates include salmonberry, evergreen huckleberry, red huckleberry, dewberry, snowberry, poison-oak, Pacific rhododendron, Oregon-grape, serviceberry, and honeysuckle. California-laurel grows under conditions that range from the cool, humid climate of coastal forests to the hot, dry climates of the chaparral or interior woodlands. Within its range, annual precipitation varies from 13 to 83 in., with 0.7 to 17.0 in. falling from April to September. Temperature extremes are -13 to 118 °F, although a milder climate is more typical, with average minimums of 31 to 50 °F (January) and average maximums of 56 to 84 °F (July). Moisture is the major factor limiting growth of California-laurel. Laurel will establish and grow in hot, dry regions but its distribution is more limited to moist microsites. Considerable damage and breakage of stems and branches is caused by snow and wind. Windthrow of laurel is common on wet soils. California-laurel crowns are commonly deformed in areas of frequent wind on coastal or ridge sites. Over most of its range, California-laurel grows at elevations from sea level to 4000 ft. At the southern limit of its range, it grows from 2000 to 5000 ft.
California-laurel grows on a wide variety of soils derived from alluvial, sedimentary, volcanic, or metamorphic parent materials. The best growth occurs on deep, well-watered, and well-drained soils, typically on alluvial benches, valley bottoms, and coastal slopes. Flowers may occur on stems as young as one year of age; abundant fruiting usually occurs after 30 to 40 years. Flower buds form during the fall before flowering, and flowers emerge before new leaves, beginning as early as November (far south) and continuing through late spring. Pale yellow flowers (perfect), about 0.6 in. in diameter grow in clusters (umbels) originating from leaf axils. The fruits are round drupes, which ripen in the first autumn after flowering, changing in color from green to yellow, brown, or purple when ripe. Each fruit contains one nutlike seed (0.6 in. in diameter); there are about 300 seeds/lb of fruit. California-laurel seed may be collected from the ground during late fall and winter, although it should be collected soon after it falls to reduce losses in viability from exposure. Germination and seedling emergence occur in autumn, soon after seedfall or in late winter and spring. Seed should be planted immediately or stored under cool, moist conditions (37 °F for up to 6 months) until spring planting. Germination of fresh seed may take up to 3 months; scarification or stratification can shorten this time to 2 months. Rates of germination are not affected by light; the highest rates occur with high humidity in moist, but not wet soil (moisture tension of -4 to -10 bar). Abundant crops of seed are usually borne every year. Establishment from seed is best where seed is covered by soil, either from soil disturbance or from soil deposition after high water. Seedlings commonly establish and grow at low light levels (1 to 8 percent of full sun) under forest or brush canopies, although growth is increased with light levels that exceed 18 percent of full sun. California-laurel sprouts vigorously from the root collar or along the trunk with increased exposure to light. To promote development of better quality sprouts, stumps should be cut close to the ground. Regeneration of California-laurel with planted seedlings has been rare. Seedlings typically develop a taproot and may be difficult to transplant unless they are grown in containers. Seedlings grow slowly for the first few years after transplanting. Under culture, seedlings appear to grow well across a range of temperature, moisture, and nutrient conditions. Little site preparation is necessary for establishing stands of sprout origin after forest clearing. Regeneration and growth are enhanced by burning or mechanically removing slash that shades stumps. Pre-established roots of the parent tree and rapid growth of sprout clumps make California-laurel a superior competitor in new stands. Rapid development of California-laurel cover at high densities of parent stumps will inhibit establishment and growth of competing species. With seedlings, or at lower densities of California-laurel sprouts, control of competing herbs and shrubs should improve the growth of young California-laurel stems. There has been little management of California-laurel, and there is no available data from experimental treatments. As demonstrated for many other sprouting species, thinning dense clumps of California-laurel sprouts may be a viable method for selecting better stems and improving diameter growth. Care must be taken to avoid damage to residual trees during management activities, since California-laurel is easily invaded by wood decays. Given its strong tendency to form curved, multiple stems, maintenance of moderate and uniform stand density and evenly spaced stems may be needed to encourage straight, well-pruned stems. There are many opportunities for growing California-laurel in mixed stands, as it readily establishes in the understory and may be grown in any crown position in even-aged or uneven-aged stands. Initial growth of sprouts is rapid; seedlings develop more slowly in typical understory environments. Long-term height growth of California-laurel is slow (<1 ft per year) on many sites, but rates of 1 to 2 ft per year are possible on good sites. Diameters of 15 to 16 in. may be achieved in 50 years. California-laurel (along with tanoak) has the highest net annual volume growth rates of any hardwood in California (3.5 percent per year). Average stand volumes for California-laurel forest types in California were 1677 ft3 per acre with maximum volumes of 3125 ft3 per acre. Almost half of the California-laurel stands in California exceed 100 ft2 per acre of basal area. California-laurel provides food and cover for various animals. Seeds are an important food source for squirrels, woodrats, mice, and birds. Deer browse young shoots during the summer. Heart rot in larger trees often provides cavity nesting habitat. Old or scarred trees are commonly invaded by decay fungi, particularly the heart rot, Ganoderma applanatum. Decay is common around branch wounds and root collars. Occasional dieback of branches is caused by Botryosphaeria spp. A stem canker (Nectria galligena) is common on stems stressed by wind or snow. Although a variety of pathogens attack foliage, serious damage is rare. Insects usually do not cause serious problems for California-laurel. The cottony cushion scale (Icerya purchasi) has been quite damaging in the past. Some oak bark beetles (Pseudopityophthorus spp.) will attack injured trees. Powderpost beetles (Ptilinus basalis) can cause serious damage to stored logs or lumber. A variety of insects consume foliage, although high concentrations of volatile compounds in California-laurel reduce the incidence of damage. There are some racial varieties of California-laurel, one of which is known for its distinctly pendulous branchelets (Umbellularia californica forma pendula). Diameter at breast height and total height can be used with tables or equations to estimate total tree volume in cubic feet and sawlog volume. Log grades have not been developed. Premium prices may be paid for burls, butts, and logs 12 in. and larger in diameter. Sawlogs usually have a minimum small-end diameter of 6 in. The relatively small volume of California-laurel that is harvested is fully utilized, and demand for California-laurel wood is high. Lumber grade recovery has not been studied. California-laurel is a moderately heavy, moderately hard wood with an even texture and a fine grain. The sapwood is whitish to light brown and typically thick. The heartwood is light brown or greyish-brown, frequently with darker streaks of pigment figure. 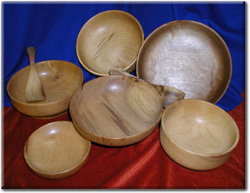 The growth rings are distinct and can be delineated by a dark band of denser latewood. The wood is diffuse-porous, with evenly distributed, distant small pores that are barely visible to the naked eye. These pores are either solitary or in groups of two or three, and are encircled by a whitish sheath. The fine rays require a hand lens to see. When freshly cut, the wood has a very characteristic spicy odor, but its volatile oils impart no taste to the wood. Burls are sometimes produced and some of the wood has interlocked grain. When soaked in water, the wood darkens appreciably. California-laurel weighs about 54 lb/ft3 when green and 39 lb/ft3 at 12 percent moisture content (MC). The average specific gravity is 0.51 (green) or 0.58 (ovendry). The strength properties of California-laurel are satisfactory for the typical uses and product applications. The wood has good resistance to indentation and splitting, but the wood has moderately low bending-strength properties. The wood holds nails and fasteners well, but holes should be prebored to prevent splitting. See Appendix 1, Table 3 for average mechanical properties of small, clear specimens. California-laurel is one of the western hardwoods that can be successfully kiln-dried when green, without first being airdried. A mild schedule is recommended to prevent surface checking and honeycomb. A suitable general schedule is shown in Table 4. End-checking from refractory wood can be a problem, so an appropriate end-coating should be applied. The green MC of the wood averages 70 percent. The shrinkage values indicate that California- laurel is a relatively stable wood; it has a radial shrinkage value of 2.8 percent (green to ovendry) and a tangential shrinkage value of 8.1 percent. For comparison, black cherry has values of 3.7 percent and 7.1 percent, respectively. California-laurel ranks very high in machinability for turning, boring, and mortising. In planing and shaping, however, chip-out difficulties arise because of the interlocked grain and the small burls sometimes present. It is advisable to consider saw-sized lumber and abrasive planing as alternatives to planer degrade. The fewest defects were obtained with hook angles of 20°. Finish sanding requires a generally fine grade of paper to avoid surface scratching. California-laurel produces satisfactory glue bonds of good strength if conditions are well controlled. California-laurel is a very beautiful and distinctive wood when finished. It takes finishes well, without the need to fill the grain. Figured wood and burls are exceptionally attractive when clear-coated. The wood is generally not stained, but when color changes are desired, dyes and transparent stains are usually preferable to pigmented types. Thick surface coatings should be avoided. California-laurel is a nondurable species that is susceptible to wood decay; it is not suitable where conditions are favorable to rot. It is also susceptible to powder-post beetle infestation and sap staining. California-laurel is used for novelties and craft items, wooden ware, turnery, furniture, paneling, flooring, veneer, and gun stocks. STEIN, W.L. 1990. California-laurel. P. 826-834 in Silvics of North America. Volume 2, Hardwoods. R.M. Burns and B.H. Honkala, coords. USDA Forest Service, Washington, D.C. Agriculture Handbook 654. TINNIN, R.O., and L.A. KIRKPATRICK. 1985. The allelopathic influence of broadleaf trees and shrubs on seedlings of Douglas-fir. Forest Science 31:945-952.